Imperial Palace is located in the center of the Imperial City, in Green Emperor Way. 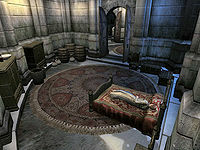 It is housed inside the White Gold Tower, the most prominent structure in Cyrodiil and the center of the Imperial City. The palace is strictly guarded by elite Palace Guards, who advise visitors to maintain quiet at all times, and not to enter any floor above the second. 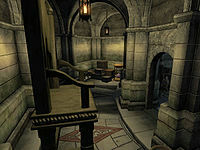 Except during a single Thieves Guild quest, the only levels available are the Elder Council Chambers and the Palace Basement, though entering the basement is trespassing. The door providing access to the upper levels of the palace is locked (key required), and there is no key that will open the door. 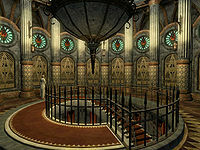 During The Ultimate Heist, a path through The Palace Sewers and The Old Way is revealed, leading underground from Beneath the Bloodworks to the Imperial Guard Quarters. 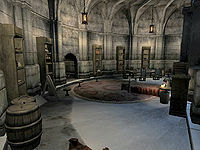 Above the guard quarters are the Elder Scrolls Library and the Moth Priest's Quarters, and the top level is the Imperial Battlemage's Chambers. The Elder Council's chambers is the only legally accessible area of the Imperial Palace. 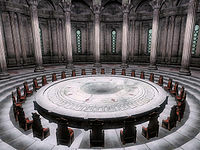 A hallway circles the main chamber which holds the large table surrounded by High Chancellor Ocato's chair and twenty-nine others. Following the hallway clockwise leads to the basement, while the other end of the hall leads to the second floor balcony over the main chamber. The other door on the second level leads to the guard quarters. Upon entering the basement from the Elder Council chambers, a set of shelves ahead on the south side of the hallway that surrounds the central area holds two clutter crates and a clutter sack. Further along in the hallway lie four crates and two barrels, both containing clutter, and beyond them another five clutter crates. Just before the end of the hallway another two clutter crates and three clutter barrels sit near the arches. At the end of the hallway are several giant-sized items: a chair, a club, a crystal ball, and an hourglass. The hourglass is used to unlock the pathway used in The Ultimate Heist. Among the oversized objects are a clutter barrel, eight clutter crates, and a non-respawning chest that can hold armor and weapons. 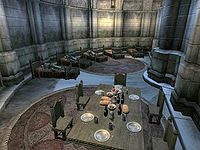 In the central area, the northern part of the room holds a clutter barrel, four clutter crates, and three food barrels. On the east side of the room sits ten more clutter crates, another seven clutter barrels, seven non-respawning clutter sacks - four with clutter and three with grain, two more non-respawning armor/weapons chests, another chest that holds clutter, a food cupboard, and four wine racks that hold between them thirty-nine bottles of cheap wine. Another clutter barrel sits on the south side of the room, near three kennels. Around the central support pillar are eighteen clutter crates, five clutter barrels, a clutter chest, and a final non-respawning clutter sack. The entrance from the Elder Council chambers leads into a hallway that surrounds the central rooms, a dining room and a sleeping quarters. The doorway at the opposite end of the hallway leads to the Elder Scrolls library. The single door on the west side of the hallway reveals the dining room, with a large central table that holds twelve carrots, six strawberries, four blackberries, four cheese wedges, three apples, three loaves of bread, three ears of corn, a head of lettuce, four bottles of beer, and a bottle each of Surilie Brothers Wine and Surilie Brothers Vintage 415 and 399. A table in the north end of the room holds two more bottles of beer, and two non-respawning chests on the northwest wall can hold armor and weapons or gold and jewelry, while a third respawning chest holds potions. Two food cupboard sit in the north and south corners of the room, and a table in the south end holds another bottles of beer. Nearby sits two food barrels and a non-respawning clutter sack. Behind the table on the east wall sits another nine non-respawning sacks - seven with clutter and two with grain - and three food barrels. The two doors on the east wall of the dining room both lead to the sleeping quarters. Two single beds lie against the west wall with a non-respawning armor/weapons chest at the foot of one and a potions chest at the foot of the other. Two of the three beds on the northern half of the east wall have non-respawning armor/weapons chests at the foot, the other a non-respawning gold/jewelry chest with five gold on top of it and another on the floor nearby. Another non-respawning armor/weapons chest sits at the foot of one of the three beds on the southern half of the wall, with potions chests at the foot of the other two. The fireplace here serves as an entrance from The Old Way during The Ultimate Heist. A table in the north end of the room holds two bottles of beer. Two clutter cupboards sit in the north and south corners of the room, with a silver dagger and longsword on top of the one in the south. Note: This section lists notable books in the Elder Scrolls Library. A complete list of books stored in the library can be found here. The first level of the library is another circular hallway. Following the hallway counterclockwise leads to a door to the second level hallway. The door on the inside wall of the first-level corridor, in the western part of the hallway leads to another, smaller hallway. Following this corridor counterclockwise leads to a lever that opens the door into the library itself, which is found by following the hall clockwise. 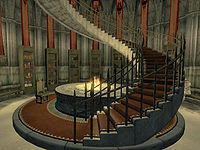 The second level hallway is also circular; the door at the end counterclockwise leads to the Moth Priest's quarters, while a doorway on the inside wall in the western portion reveals the second-level balcony of the central library. In the library, seven tall bookshelves line the west wall. 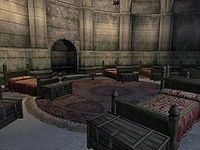 The southernmost holds two non-respawning clutter sacks and seven notable books: Aevar Stone-Singer; Azura and the Box; Dwemer History and Culture; Feyfolken I, II, and III; and History of Lock Picking. The next holds four bottles of Surilie Brothers Wine. The bookshelf beside it holds several ingredients: three samples of ironwood nut, two mandrake roots, two samples of columbine root pulp, a daedroth tooth, fire salts, a white seed pod, a sample of harrada, and wisp stalk caps. The central set of shelves holds two more bottles of Surilie Brothers Wine, as do the shelves next to it. The bookshelf beside the northernmost holds two expert chameleon scrolls and an expert detect life scroll along with a non-respawning jewelry chest. The northernmost bookshelf holds another non-respawning jewelry chest and a copy of The Third Door. 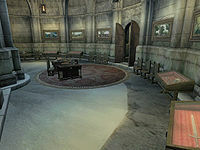 A chair sits at the pedestal in the center of the lower level, where you receive the Elder Scroll during The Ultimate Heist. The entrance to the Moth Priest's quarters from the library enters into another circular hallway with a door to the Imperial Battlemage's chambers at the other end. The door on the northwest side of the corridor leads into a large room with five single beds on the northeast bed. Three of them have clutter chests at the foot, while the chests at the foot of the other two beds hold potions. Two food barrels sit in the southeast corner, and the table in the west end of the room holds twelve strawberries, three apples, three loaves of bread, a bottle of Surilie Brothers Wine, three bottles of Surilie Brothers Vintage 415, and a bottle of Surilie Brothers Vintage 399. The door on the southwest side of the hall leads into a storage room with three food barrels, three non-respawning grain sacks, and a table set with six apples, two loaves of bread, and three bottles of Surilie Brothers Vintage 415 against the north wall. The northeast corner holds two food barrels, a potions chest, and two wine racks that hold seventeen bottles of cheap wine. The table in the southeast corner holds two apples and a bottle of Tamika Vintage 399. The doorway on the east wall here leads into a smaller bedroom with a double bed against the north wall. Two clutter chests - along with a table that holds two apples, two loaves of bread, and two bottles of Surilie Brothers Vintage 415 - sit in the northeast corner. Another bottle of the same sits on top of one of the two clothing cupboards on the southeast wall. In the southwest corner sits three food barrels and three non-respawning clutter sacks. The door on the west side of this top-level hallway reveals an office room with a large desk facing the door; on it sits three apples, a loaf of bread, two bottles of Tamika Vintage 399, and eight pieces of gold. The table in the southeast corner holds three more apples and another bottle of Tamika Vintage 399. The display cases on the southwest wall hold various items. The first one contains three common soul gems filled with common souls and a Battle Axe of Depletion (a guaranteed magic item). The second contains seven potions: a strong chameleon potion, a cure poison potion, a strong fortify strength potion, a strong invisibility potion, a strong night eye potion, a strong silence potion, and a strong water breathing potion. The small table in the northeast corner also holds two apples and a bottle of Tamika Vintage 399, and the display case near this on the northwest wall holds a silver dagger and longsword. The two doors on the east wall of the office lead into the bedroom, where a large bed lies against the west wall between the doors. A clutter chest sits at the foot with five gold on top of it. A small table on one side of the bed holds a bottle of Tamika Vintage 399; the other holds a non-respawning clutter sack. Also against the west wall are a food barrel, a clothing cupboard, a food barrel, a non-respawning gold/jewelry chest that sits on top of the cupboard, and two stacked wine racks that hold seventeen bottles of cheap wine. Three food barrels and six non-respawning sacks, four with clutter and two with grain, sit in the southwest corner of the room. The table in the southern end is set with six strawberries, three apples, three loaves of bread, and a bottle each of Surilie Brothers Wine and Surilie Brothers Vintages 415 and 399. Six non-respawning clutter sacks sit on the northernmost bookshelf. The shelf beside it holds four bottles of beer and two food barrels sit between them. The shelves north of the fireplace holds two more non-respawning clutter sacks, while the shelves south of the fireplace hold a non-respawning clutter sack, two bottles of Surilie Brothers Wine, and a copy of the speechcraft skill book 2920, Second Seed. The fireplace serves as a doorway during The Ultimate Heist, leading back to The Old Way. For more information, see the Oblivion White Gold Tower article. This page was last modified on 8 July 2018, at 14:09.